So, with all of that said, here is our menu for the week. Enjoy! For more menu ideas, go to orgjunkie.com. This recipe is awesome! 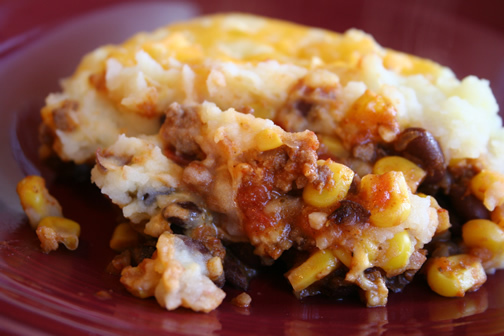 It is a great way to use up leftover mashed potatoes. 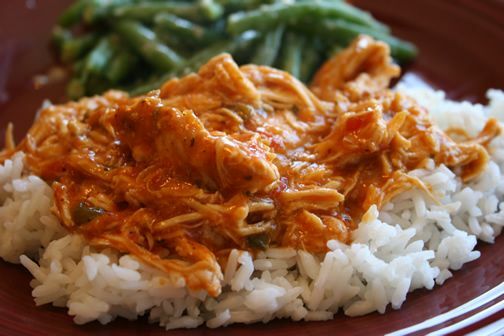 It's very filling and makes a ton, so it was great for leftovers for our family this week. Brown ground beef with onion; add all ingredients except potatoes and cheese. Simmer for 2-3 minutes. Pour into a 9x13” pan. Top with 1/2 cup cheese. Spread mashed potatoes over the cheese and meat mixture. Top with remaining cheese. Bake at 350 for about 25-30 minutes or till hot and bubbly. 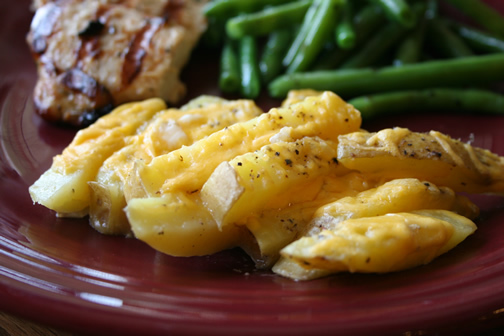 These remind me of an easy version of au gratin potatoes, but without all of the slicing and layering. I used my French fry cutter to cut the strips, which makes it fast and easy. Arrange potatoes in a glass baking dish. Mix milk and butter and pour over the top. Sprinkle liberally with salt and pepper. Cover and bake at 425 for 30 minutes or till milk is absorbed and potatoes are tender. 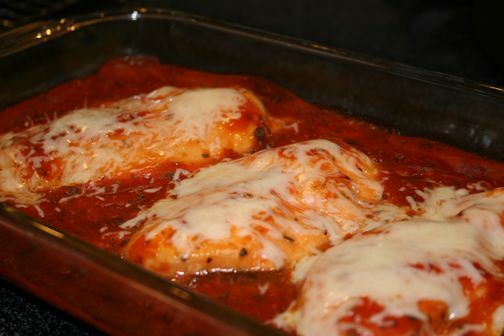 Sprinkle with cheese and bake, uncovered, for about 5 minutes or till cheese melts. 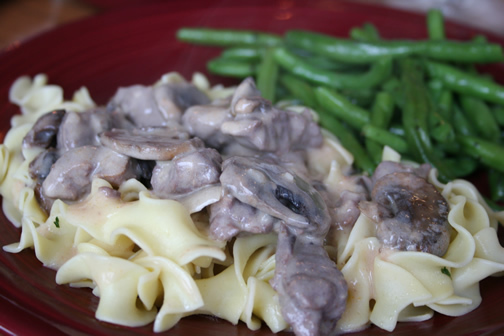 This is an amazing beef stroganoff recipe. It tastes wonderful and makes a huge batch. Serve it over rice or egg noodles. 1. Cut meat into bite-sized pieces. 2. In skillet, cook and stir mushrooms and onion in butter until onion is tender; remove mushrooms and onion. 3. In the same skillet, brown meat lightly on both sides. 4. 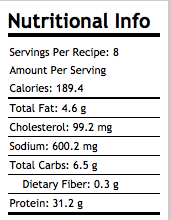 Set aside ¾ cup beef stock; add remaining stock, catsup, and garlic to skillet; stir to mix with meat. 5. Cover and simmer 15 minutes. 6. Blend reserved stock and flour; stir into meat mixture. 7. Add mushrooms and onion. 8. Heat to boiling, stirring constantly; boil 1 minute. 9. Stir in sour cream; heat to serving temperature. I've been up late too many nights and need to head to bed, so I'll have to update recipes and share more info about the week later. Here's this week's menu. For more ideas see orgjunkie.com. Saturday - Backpacking! Eat on the trail! Well, I didn't do the best job of sticking to the menu this week. 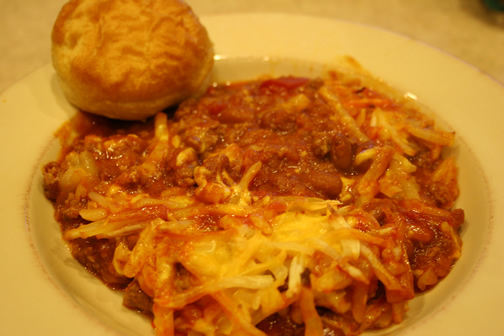 Time got away from me and I didn't get a chance to make the Cheesy Hash Brown Chili or the Soda Can Chicken, so they will be back on for this week. 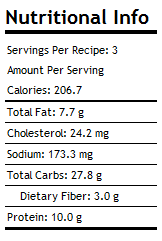 The hit of the week was the Crockpot Salsa Chicken. It was very good and very easy. We did have a nice Easter weekend. We went to the Rock and Worship Roadshow and got to see one of Corey's groups - Hawk Nelson. He even got their autographs. That was one happy boy. :) This week we have to go go a band concert and I have to present a workshop for our local MOPS group on how I use my computer as a mom. Should be fun. Here's this week's menu. For more menu ideas, go to orgjunkie.com. Have a great week! On to the food stuff. I made a strawberry cake that has an interesting story to go with it. Be sure to read the recipe post for the details. 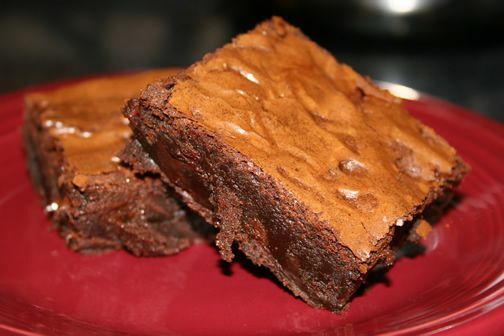 ;) I also made some brownies that were pretty close to tasting like boxed brownies, which are my favorite. Homemade ones usually turn out too cakey and don't have the nice crackly top that boxed ones have. These are worth making. I'm trying quite a few new recipes this week, so be sure to check back occasionally for the pictures. Here's this week's menu. For other menu ideas, go to orgjunkie.com. Preheat the oven to 350°F. Lightly grease a 9" x 13" pan. In a medium-sized microwave-safe bowl, or in a saucepan set over low heat, melt the butter, then add the sugar and stir to combine. Return the mixture to the heat (or microwave) briefly, just until it's hot (about 110°F to 120°F), but not bubbling; it'll become shiny looking as you stir it. Heating this mixture a second time will dissolve more of the sugar, which will yield a shiny top crust on your brownies. While the sugar heats a second time, crack the 4 eggs into a bowl, and beat them with the cocoa, salt, baking powder, espresso powder, and vanilla till smooth. Add the hot butter/sugar mixture, stirring until smooth. Add the flour and chips, again stirring until smooth. Note: If you want the chips to remain intact in the baked brownies, rather than melting in, let the batter cool in the bowl for about 20 minutes before stirring in the chips. Spoon the batter into a lightly greased 9" x 13" pan. Bake the brownies for about 30 minutes, until a cake tester inserted into the center comes out clean, or with just a few moist crumbs clinging to it. The brownies should feel set on the edges, and the center should look very moist, but not uncooked. Remove them from the oven and cool on a rack before cutting and serving. 1. Heat oven to 425ºF. Coat 15x10-inch baking sheet with no-stick spray. 2. Whisk together oil, rosemary, garlic powder, salt and pepper in large bowl. Add potatoes. Toss well until coated. Spread evenly in prepared pan. 3. 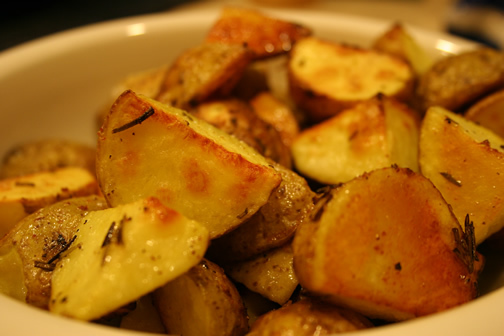 Bake 30 to 35 minutes, stirring occasionally until potatoes are fork-tender and golden brown. This chicken is incredibly moist and tasty. 1. Remove the giblets, etc. from the chicken if it has them. 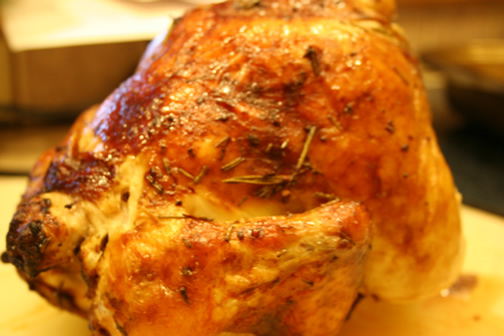 Rinse chicken with cold water; pat dry and place chicken in a large zip-top plastic freezer bag. 2. Whisk together oil, marinade, rosemary, garlic and pepper. Pour evenly over chicken. Seal bag, and refrigerate, turning occasionally, for 8 hours. Remove chicken from marinade, discarding marinade. 3. Using a can opener, carefully remove lids from the soda can. Remove about one-fourth soda from each can, leaving remaining soda in can. Place can in a lightly greased large roasting pan. Place chicken upright onto a ginger ale can, fitting can into cavity. Pull legs forward to form a tripod of sorts, allowing chicken to stand upright. Add chicken to slow cooker. Sprinkle taco seasoning over chicken. Mix salsa and soup; pour over chicken. Cook on low for 6 to 8 hours. Shred chicken with a fork. Stir in sour cream until heated, then serve over rice or tortillas. Super easy, really fast, and it tastes great! Place the chicken in an 11 x 8-inch (2-quart) shallow baking dish. Stir the soup, Italian seasoning and garlic powder in a small bowl. Spoon the soup mixture over the chicken. Bake at 400°F. for 20 minutes or until the chicken is cooked through. Sprinkle the cheese over the chicken. Let stand for 5 minutes or until the cheese melts. My mom sent me this one that she got from Rachel Ray. In a large saucepan, heat the olive oil over medium heat. Add the onion, chili powder and cumin and cook, stirring, until the onion is soft, about 5 minutes. Stir in the tomato paste. Add the beef and cook, breaking up the meat, for 5 minutes; season with salt and pepper. Add the beans and the tomatoes with their juice and bring to a boil. Lower the heat, partially cover and simmer, stirring occasionally, for 20minutes. Transfer to an 8-by-11-inch baking dish. potatoes and cheese. Scatter the potato mixture over the chili. 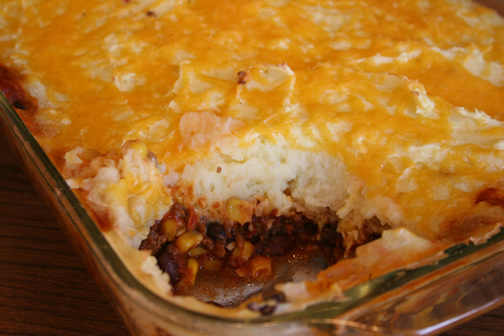 Place the baking dish on a baking sheet and bake until the potatoes are cooked through and the chili is bubbling, about 35 minutes. A couple of weeks ago, my church book club met at a local tea room called Lola's. The dessert specialty there is strawberry cake, and ever since I ate a piece I have been craving it. I decided today to try to recreate it at home. I thought I had it just about perfect, three tiers and all, until I was doing my final swipe of frosting on the sides to make it look pretty, and I dropped the whole darn thing onto the floor right in front of my black lab. I was pretty devastated, but my hubby came to my rescue. Luckily, Nimbus is very well trained and didn't make a move toward the cake. Eric was able to scoop up the two layers that didn't hit the floor and put them on a cake plate. 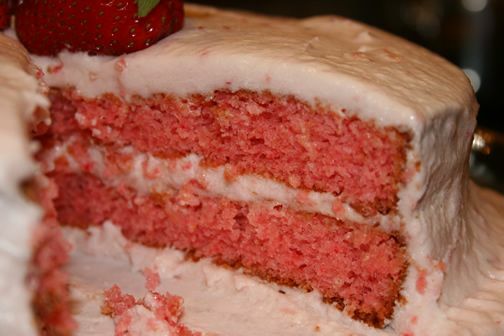 I had enough frosting left to refrost what was originally the bottom layer of the cake (now the top), and I now have a two-layer strawberry cake. Even though it's not quite the visual picture I had hoped for and it's lacking a layer, it tastes great - just like Lola's! 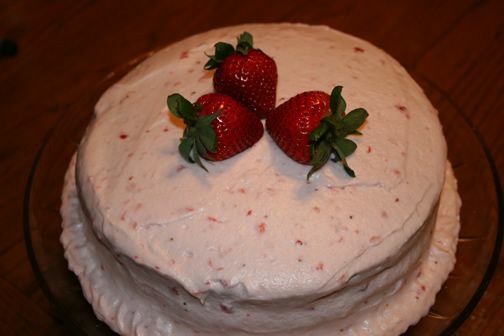 This was my first time to make a homemade buttercream frosting, and if you decide to make this recipe, don't use a cup of strawberries. It makes the frosting too runny. I used 2 bags of powdered sugar trying to make the frosting the right consistency, and it still was too runny. I would only use a 1/2 cup next time. Luckily, it still tastes fabulous. Pour batter into 3 greased and floured 9-inch cakepans. Bake at 350° for 23 minutes or until cakes spring back when lightly pressed with a finger. Cool in pans on wire racks for 10 minutes. Remove from pans; cool completely on wire racks. 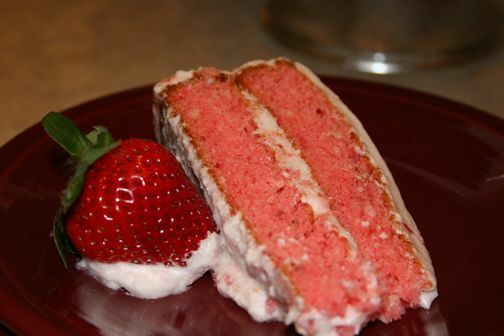 Spread Strawberry Buttercream Frosting between layers and on top and sides of cake. Serve immediately, or chill up to 1 week. Finely chop the strawberries. Place the butter in a large mixing bowl. Add 4 cups of the sugar and then the milk and vanilla. On the medium speed of an electric mixer, beat until smooth and creamy, about 3-5 minutes. Add the strawberries. Gradually add the remaining sugar, 1 cup at a time, beating well after each addition (about 2 minutes), until the icing is thick enough to be of good spreading consistency. Icing can be stored in an airtight container for up to 3 days. The Package is in the Mail!